We've previously covered how to create a 'RESTful' API (more accurately a JSON API) using Symfony 4. We've covered how to create a Symfony 4 JSON API with as few extra dependencies as possible, and also a separate build using FOSRESTBundle. Now, let's take a look at recreating our Album API using the API Platform. 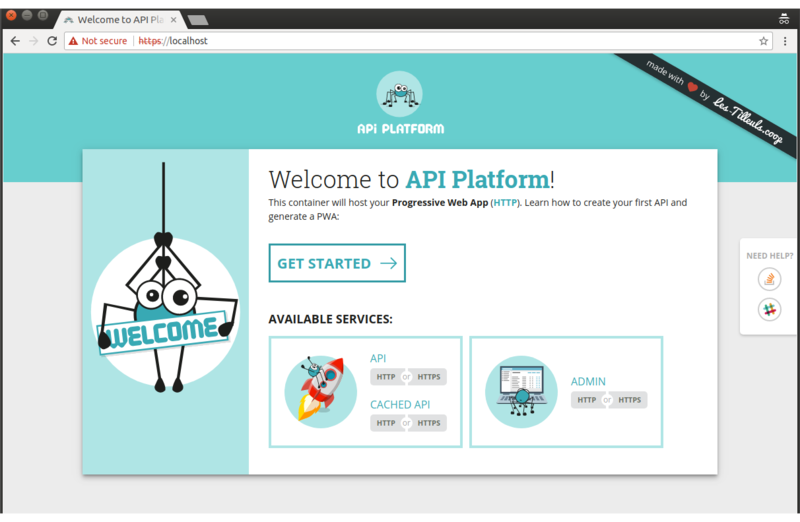 If you haven't heard of API Platform before I genuinely think your socks are about to be knocked clean off. Out of the box, this is the most fully featured API I have ever found in any programming language. This barely scratches the surface of what's in there. And this isn't meant to be a sales pitch. But I would be amazed if you aren't about to be impressed. Yes - there is one. This is just my opinion. This doesn't work like most every other Symfony site I've ever built. This won't be like FOSRESTBundle. We won't be working with forms, building our own controllers, defining routes, or most anything you'd do typically. We won't be using MVC. The API Platform uses Action Domain Responder (ADR) instead. You can still do all the usual Symfony 'stuff'. This is a Symfony-based project, after all. But there are new ways of working here. Ultimately this means there is an additional learning curve. Is API Platform The Official Symfony 4 API Standard? Before proceeding it's worth quickly covering whether the API Platform is now the officially recommended way to make an API with Symfony 4. The api-platform/api-pack is tagged 'Official'. Somewhat strangely, FOSRESTBundle doesn't come up for a search on the keyword of 'api'. This is because the search facility - at the time of writing - only considers the Recipe title. With 'api' not being in friendsofsymfony/rest-bundle, the search facility misses this - reducing discover-ability. 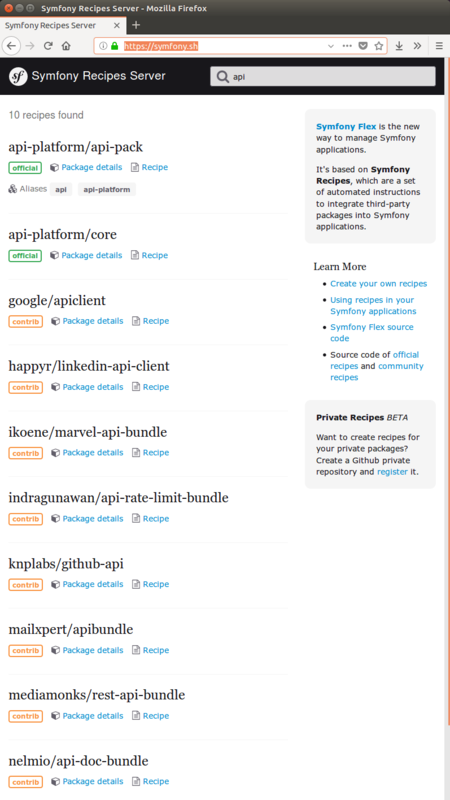 Even when we do find friendsofsymfony/rest-bundle, the recipe is marked as contrib (or third party, to you and me). From an outsiders perspective it does appear that API Platform is the officially recommended approach for making an API with Symfony 4. This said, I love FOSRESTBundle. I use it here on CodeReviewVideos.com, as well as on a bunch of other sites. It's still actively maintained and feature full, and potentially a great fit for your needs. As ever, use your best judgment, and be grateful for the variety of options. To work with API Platform most easily, you will need Docker and Docker Compose. If you are new to Docker, please watch my Docker Tutorial for Beginners. Everything you will need to know is covered in that course. Compared with both the 'basic' Symfony 4 JSON API, and the Symfony 4 with FOSRESTBundle API implementations, getting setup here is an absolute breeze. Head over to the Download page. I'll be working with API Platform 2.2.6, at the time of recording. Please note, if using a later version of API Platform, things may be different. For best compatibility with this tutorial, please stick to ~2.2.6. In other words, download the file and extract it to somewhere on your machine. Your terminal will fill up with a bunch of output. And this process may take a while, particularly if on a slow Internet connection. Heads Up: Got Postgres up and running on your machine already? For simplicity, stop your local Postgres instance. If feeling daring, change the exposed public port in docker-compose.yml to something other than 5432. Don't forget to update your api/.env file! Hey guess what? We're done. I'm sure I don't need to encourage you to have a play around with all this new functionality. We'll get on to our own implementation next. Because we ran Docker in detached mode (docker-compose up -d) it's really easy to forget you've got a full stack of 'stuff' up and running in the background. Don't forget to run docker-compose down when finished. This will safely stop and remove the running API Platform Docker containers. You must run this command from the project root directory. This means I can run the make dev command to bring my environment up, and restart it with the same command. And I can shut down with make down. When working with environment variables in particular, it can be handy to easily restart your entire stack without having to type a bunch of stuff. Hey, it works for me.